Over the past several decades, rapid developments in both molecular and information technology have collectively increased our ability to understand molecular recognition. One emerging area of interest in molecular recognition research includes the isolation of aptamers. Aptamers are single-stranded nucleic acid or amino acid polymers that recognize and bind to targets with high affinity and selectivity. While research has focused on collecting aptamers and their interactions, most of the information regarding experimental methods remains in the unstructured and textual format of peer reviewed publications. To address this, we present the Aptamer Base, a database that provides detailed, structured information about the experimental conditions under which aptamers were selected and their binding affinity quantified. 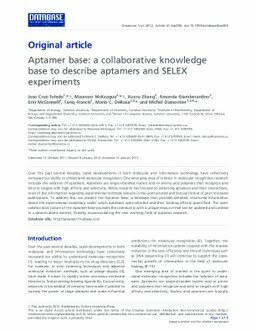 The open collaborative nature of the Aptamer Base provides the community with a unique resource that can be updated and curated in a decentralized manner, thereby accommodating the ever evolving field of aptamer research.